In his report, Inch flagged the bankruptcy of helicopter leasing company Waypoint Leasing, the result of ongoing distress in the offshore oil & gas sector, and said that major energy customers have reduced helicopter usage, resulting in challenging conditions in the helicopter leasing industry, with excess fleet capacity and lower demand. Why is this relevant to GE? Because as Inch also notes, in 2014 GE acquired Milestone Aviation - another provider of aircraft and helicopter leasing services - for $1.8 billion in 2014, and assuming the industrial behemoth has not since written down Milestone’s goodwill, the helicopter business would account for nearly 75 percent of GE Capital’s reported goodwill of $984 million at third quarter of 2018, the analyst added according to Bloomberg. "A write-down of its Milestone assets could prove highly material to GE Capital," Inch said. 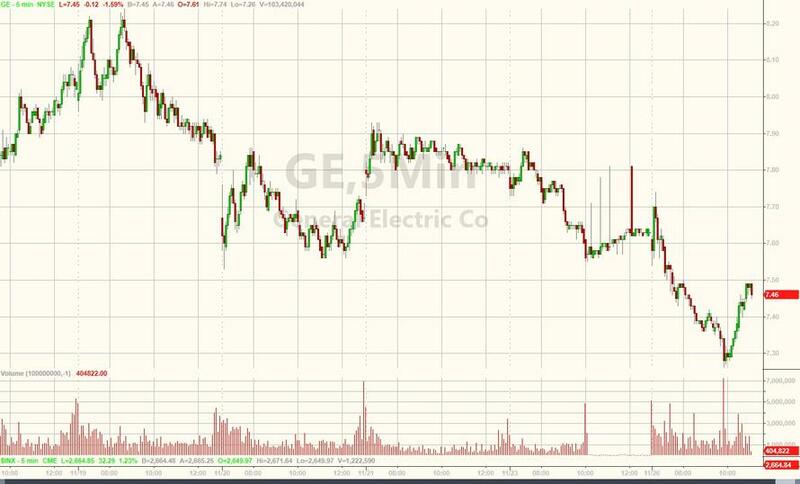 And with the market on edge about any potentially negative news regarding GE, no matter how immediately actionable, traders have sold first and no longer even bother to ask questions later, as GE's intraday stock price reflects.